Dunkin’ Donuts opened what it calls a “store of the future” Saturday in El Cajon, promising the first 100 customers free coffee for a year. The 2,036-square-foot store at 350 Fletcher Parkway is the first Dunkin’ Donuts in San Diego to test a variation of a new design, including a cold beverage tap system, the chain said. The new tap system makes the El Cajon outlet the first Dunkin’ in San Diego to offer Nitro Coffee, a spokeswoman said. 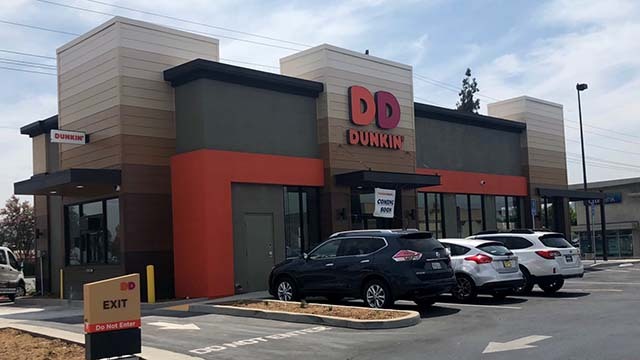 “The El Cajon store [also] is one of a select number of Dunkin’ Donuts restaurants testing new signage that refers to the brand simply as “Dunkin’,” she said. Saturday’s ribbon cutting opened a weeklong fundraiser with the Travis Manion Foundation, where $1 of the price of a customized donut will be donated to the foundation. The grand opening celebration also was to feature San Diego Legion rugby players Siaosi Mahoni and Nate Augspurger as well as Gulliver, the San Diego Gulls mascot. 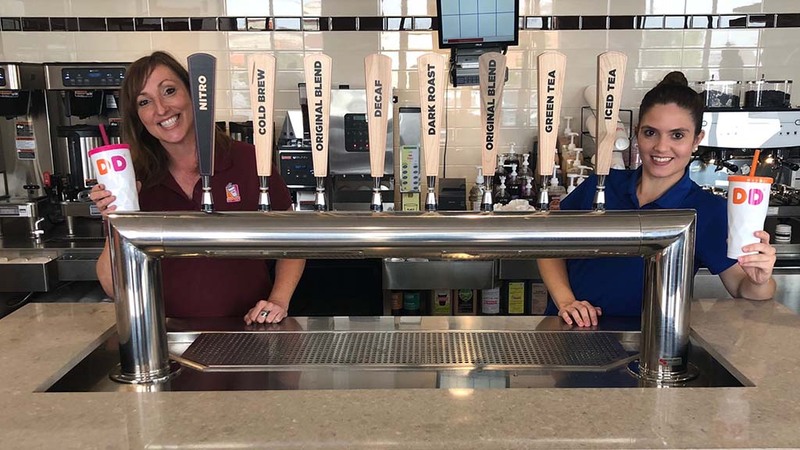 Premium Pours: Dunkin’ Donuts’ cold beverages are now served through an innovative tap system serving eight consistently cold beverages such as coffees, iced teas, cold brew coffee and nitro infused cold brew coffee. 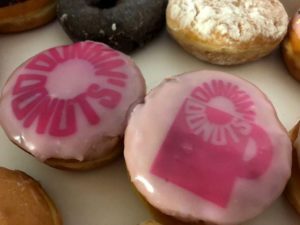 Dunkin’ on Demand: Dunkin’ Donuts has introduced an area dedicated to mobile pickups, so that members of the DD Perks Rewards program who order ahead via Dunkin’s Mobile App can get in and out fast. Guests will be able to track the status of their orders placed for pickup inside the restaurant via a new digital order status board. And increased energy efficiency: The new Dunkin’ Donuts is a DD Green Achievement restaurant. Such outlets are designed to save 25 percent more energy than to standard Dunkin’ Donuts restaurants. The franchisee opened San Diego’s first drive-thru Dunkin’ Donuts in National City, and over the past three years has opened or bought locations on seven military bases and four other locations across San Diego. Founded in 1950, Canton, Mass.-based Dunkin’ Donuts has more than 12,600 restaurants in 46 countries worldwide.